Meatball Stuffed Shells - easy weeknight pasta casserole! Fill pasta shells with frozen meatballs and top with sauce and cheese. Ready to eat in under 30 minutes!! 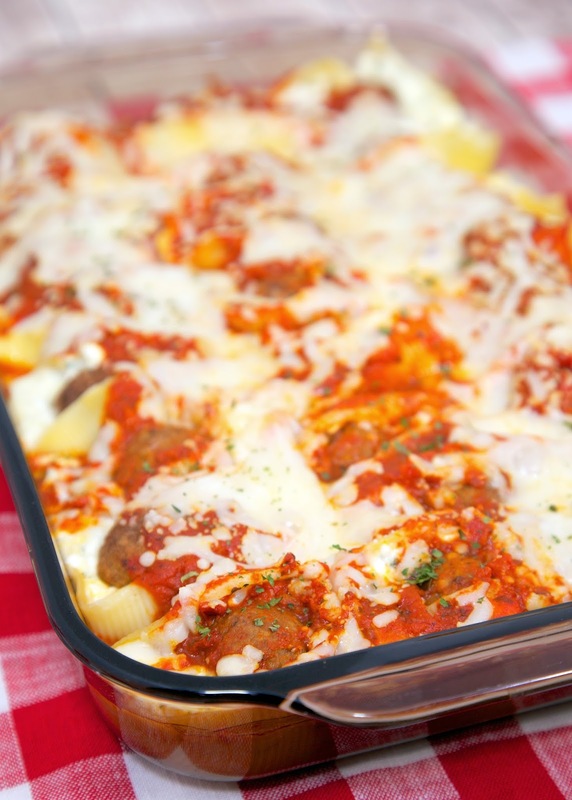 Everyone LOVED this easy pasta casserole recipe! Can freeze for later too! I was cleaning out my freezer and found a package of frozen meatballs. 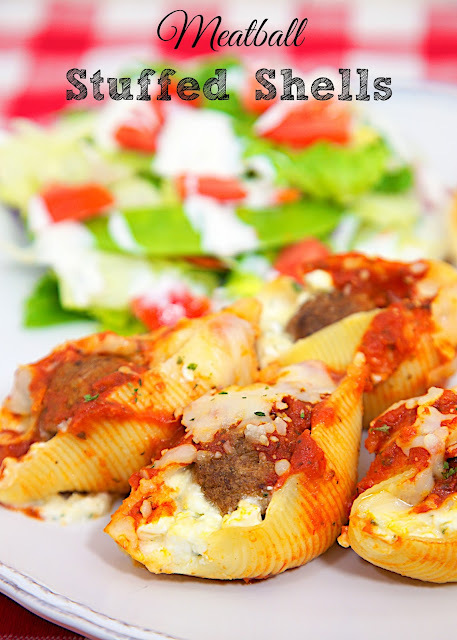 I was brainstorming on what to make with them and thought what about Meatball Stuffed Shells? I decided to give it a shot. Guess what? They turned out great! We added a salad and some garlic bread for a delicious Italian feast. I like cheese in my stuffed shells, so I adapted my usual stuffed shell recipe to add meatballs. These were delicious! I didn't thaw the meatballs before baking. I just let them bake along with the pasta. It worked great and saved some time. This makes a lot. We ate this for dinner and lunch the next few days. Next time I would make the whole recipe and freeze half of it. Preheat oven to 375ºF. Lightly spray a 9x13-inch pan with cooking spray. Set aside. Cook jumbo pasta shells according to package. Drain and cool. Combine cottage cheese, parmesan cheese, egg, dried parsley and 1 cup mozzarella cheese. Bake for 25-30 minutes, until bubbly. Make ahead, when you get home from Christmas shopping, just pop in the oven! This looks soooo good, can't wait to try it ! Happy Thanksgiving! Bake uncovered, right? Looks delicious. Thanks. yes - I baked it uncovered. Made this tonight! Another winner! What size are the meatballs? Thx. Just made this and it was fantastic! Thanks for sharing the recipe. If you were to freeze it before cooking, would you want to defrost or bake frozen? Thanks! My kids love this. I finally froze a batch but now I am unsure how to cook. You can do either - if you bake it frozen, cover it and bake it about 15 minutes to thaw it in the oven. Remove the foil and bake it an additional 25-30 minutes. With that said, the recipe is actually very yummy. I really like this dish, and if I can figure out an easier way to stuff the shells, I would definitely make this again. Served it with a green Italian salad, and garlic bread. I take it the temperature would be the same if you bake it after freezing a portion thawed or unthawed.